I love food. I love cooking food, finding new foods, photographing food, eating food. Food makes me irrationally happy, and it's why I started a food blog, but every day I scroll through my Instagram feed and I see tons of people eating meal replacement bars, protein puddings, pro-gurts (protein yogurt), and other things that just look like soylent-protein-power-monstrosities. If it makes other people happy I'm all for it. I'm not knocking their lifestyle (especially since they seem far healthier and more active than I am) but eating that stuff would be torture for me. It takes all the fun and texture out of food! Along with my lifelong love of food, I'm also a frugal shopper. I love a good deal, so when I saw that these Fit & Active bars were on sale at Aldi for only .99 cents a box, I thought this could be my version of a meal replacement bar. I typically don't eat breakfast, and I don't eat lunch until 1-2PM, so eating one of these for breakfast is probably a good idea, right? 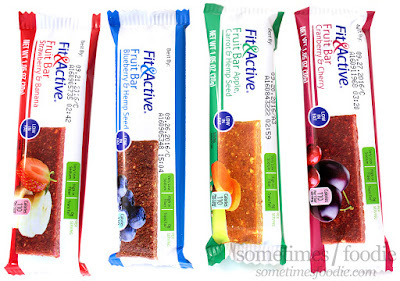 Then again, will a "healthy" fruit bar that only cost me .20 cents each taste good? Strawberry Banana - normally my go-to fruit combination for smoothies or juices. This one is pretty okay. The creaminess of the banana helps to balance out the dryness of the bar and the strawberry brightens things up a bit with a hint of vitamin C and tangy flavoring. Not bad, not bad. I rather eat real sliced up strawberries and bananas, or a smoothie, but for an on-the-go snack, this isn't terrible. The base for these bars is really dry and pulpy, and it makes me want to drink a bunch of water, but that's another thing that's good for you, so that's good too, I guess. I already drink 2 quart sized soup-canning mason jars of water at work every day, 'cause I'm classy like that, but even with all that hydration this bar still left my mouth feeling like a fruity dessert. Cranberry Cherry - this one has deeper cherry juice notes with an added cranberry tartness that really helped me power through the dryness of the bar and it left me with a really refreshing cherry-flavored-Craisins aftertaste that I liked. The bar is still really dry and I hate the initial flavoring and texture, but the fruit makes this one the most tolerable and it's easily my favorite of the four, but I'd still rather eat real fruit. Thanks to the tartness of the fruit in this combo it left my mouth feeling a lot less dry. Apple, Carrot & Hemp Seed - easily the saddest flavor of the bunch. I was really hoping that this flavor would have some carrot-cake-like qualities, because I LOVE carrot-cake, but this was the saddest, driest, most Chapstick-like version of carrot-cake ever. You get some sweet apple, but there's a lot of sad, dry, pulpy carrot-ness to wade through and the whole thing tastes chalky. The seeds add some crunch, and the texture made this more edible than if it were just a dried out fruit & veggie paste brick, but overall it was awful. I still have a lot of this one left and I have no idea what I should do with them...because I certainly don't want to eat them anymore. Blueberry & Hemp Seed - the deeper berry flavoring makes it less chalky than some of the other flavors, but it's still really dry. So, it's not great, but I've had worse. I like what the blueberry flavoring is bringing to the table, but it's still not refreshing or appealing. The hemp seeds add a little crunch, similar to the seeds in Fig Newtons, but it's not all that great. 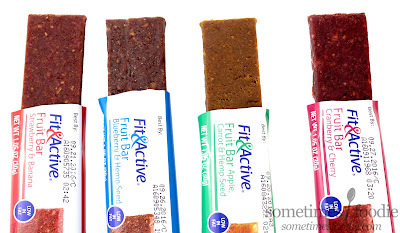 Overall, these bars are more of a last-report purse, car or backpack snack than something I'd happily reach for instead of food. 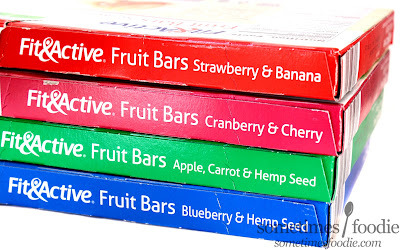 For the most part each bar is just over 100 calories, and there are so many more satisfying things you could waste those calories on. They make me feel like I'm eating stale, dry fig-Newton filling that somehow escaped it's cookie-shell and was sitting in the bottom of my backpack with pencil shavings all semester. Funny descriptions aside, I do NOT enjoy eating them. They make me sad and they make me miss real food. Normally I'm not too picky about food items, but even if packs of these were on sale for .50 cents a piece, I wouldn't re-buy them, and I think that says a lot. I tried their Carrot and Hemp Seed bars and I fell in love. I liked the soft squishy texture, and the fruit ingredients in it made it sweet like a candy bar. Will gladly buy again if able to. I like these. They're weird, but in a good way. It's dried fruit so I would not expect them to be juicy or anything. 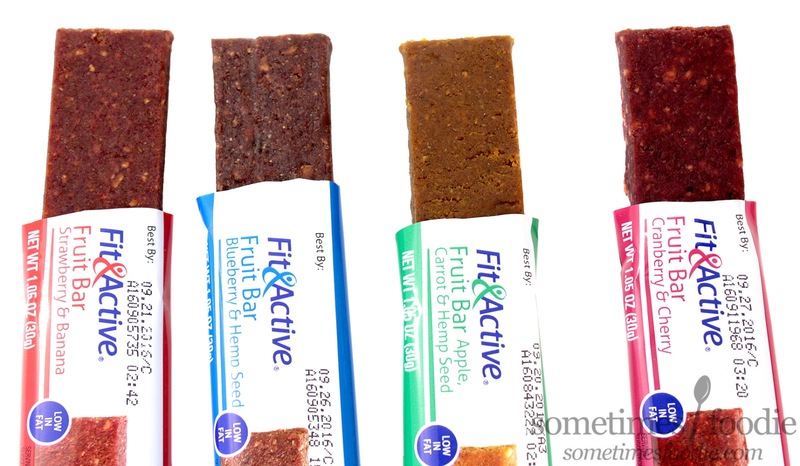 I like them for quick snack, keep in purse or work bag. I liked all of them. They are tasty and convenient. I LOVE them, but I'm going to ask my Aldi's where are the boxes. They are selling these individually for .49. Smh. 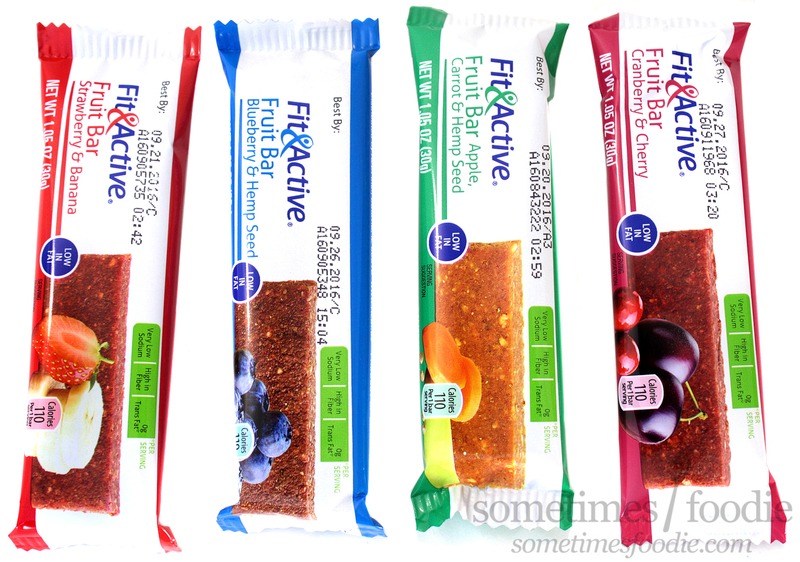 I love these fruit bars and they're reasonably priced! They give me an energy boost and even substitute for a meal sometimes, and the ingredients seem quite healthy. Does anybody know if they are free of GMO's? Since they are a product of Germany, I'm hoping the answer is "yes" because I've heard European countries don't allow GMO's in their food.